Most of these photos once belonged to my great-grandparents, Anna and Carl Mazanti. Their son Erik, my grandfather, helped me identifying many of them in his last years. Click on the small pictures! 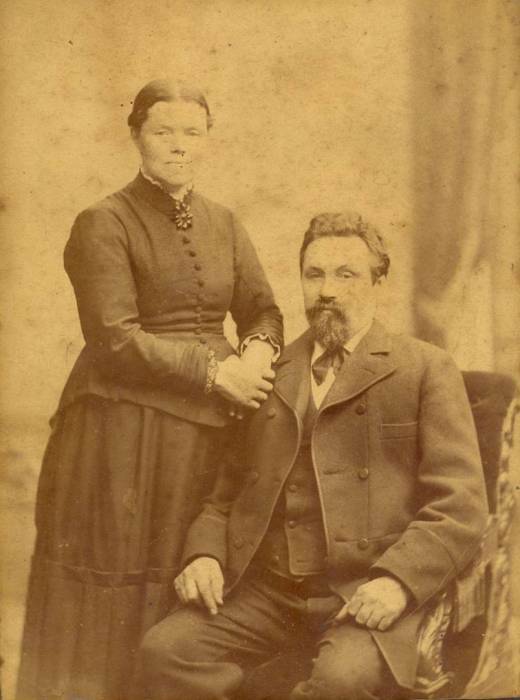 Carl Emanuel Mazanti, casual labourer in Odense, Funen and his wife, Johanne Pedersdatter Krogh - founders of the Mazanti family's younger branch. Carl was half Italian, half Polish. Both were born in Denmark in 1800. Judged by their looks the photo was taken about 1860. The children probably paid for the photographing as the parents were poor. The rest of the pictures are reproducing Carl Mazanti and Johanne Krogh's children, grandchildren and great-grandchildren. 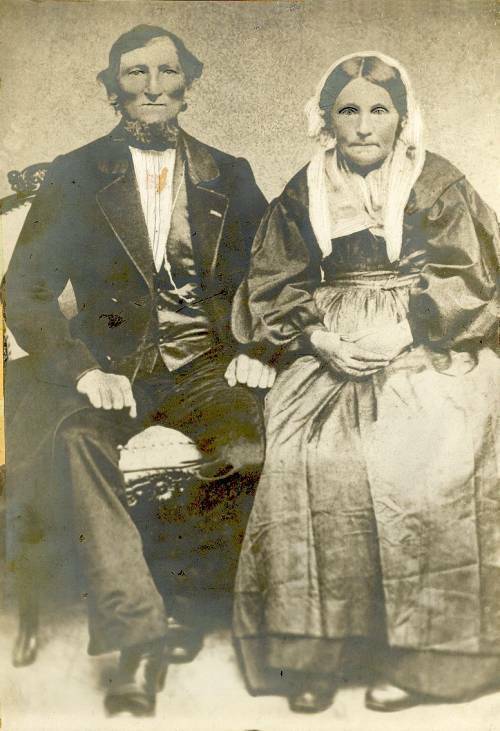 I'm quite confident this is Carl Ferdinand Mazanti, journeyman miller near Vejle, Jutland and his wife Magdalene Fibiger (about 1875). 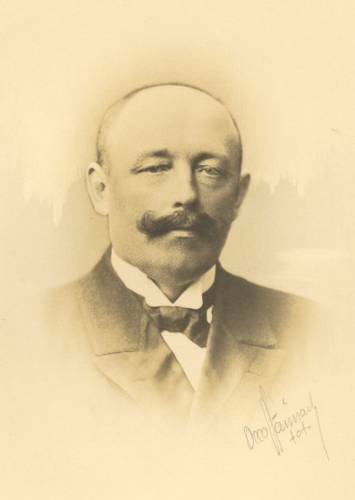 Carl Ferdinand, born 1825, was the oldest son of Carl and Johanne Mazanti. 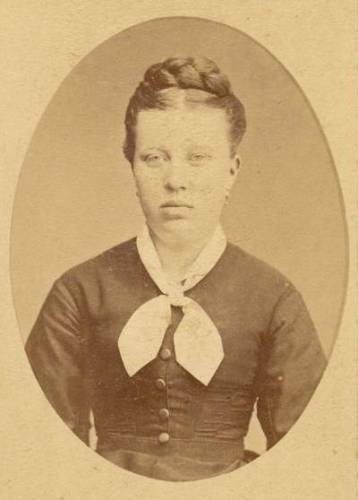 Caroline Amalie Sophie Mazanti, called Amalie (born 1858), a photo taken in Vejle, Jutland. Daughter of Carl Ferdinand og Magdalene Mazanti. Quite early she became a widow. Carpenter Alexander Mazanti's widow Dorthea, Carl and Johanne Mazanti's daughter-in-law (1924). Accompanied by her nephew's grandson, Claus Mazanti, and the child's great-grandfather, baker Jens Hansen. Old Dorthea came to live at her nephew Carl Mazanti's to be nursed in the short time she had left - but she thrived and lived there for eight years! 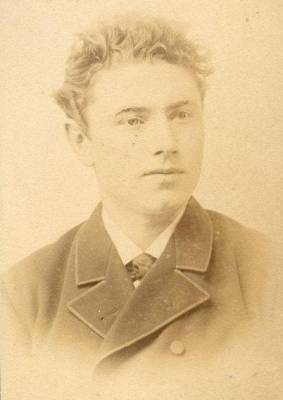 Hans Peter Mazanti, Carl and Johanne Mazanti's second-youngest son, a young shoemaker in Odense about 1860. 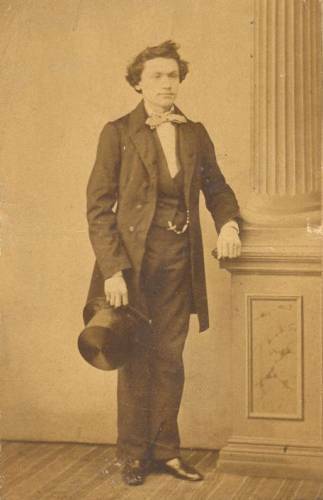 1857, when he got his journeyman's certificate, his master gave him a coat, a pair of trousers, a waistcoat, a hat and a pair of boots (according to the contract as a trainee) - probably the cloth he wore when having this photo taken. 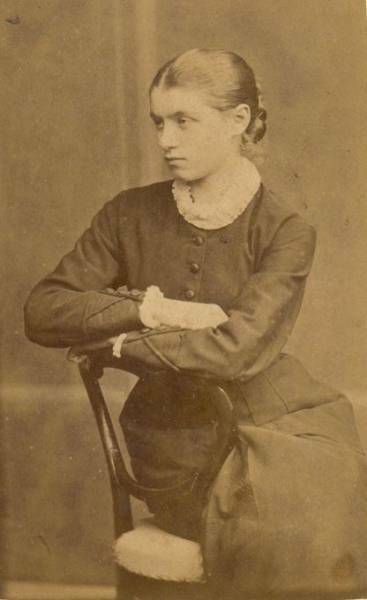 1862 Hans Peter Mazanti married Cathrine Hansen. 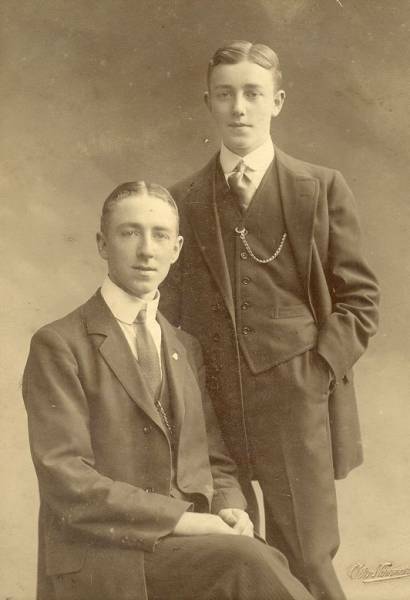 These toodlers are their oldest children, Carl (born 1865) and Peter (born 1863). 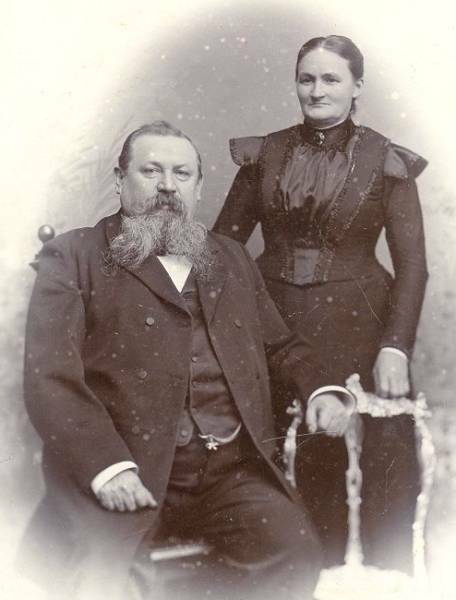 Hans Peter and Cathrine Mazanti (about 1875). During this period they went through many sorrows - they lost five small children. 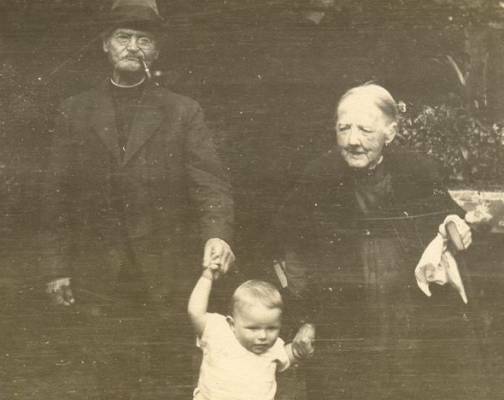 A child died in 1869, another one in 1874, two ones in 1875 and finally a child in 1881. 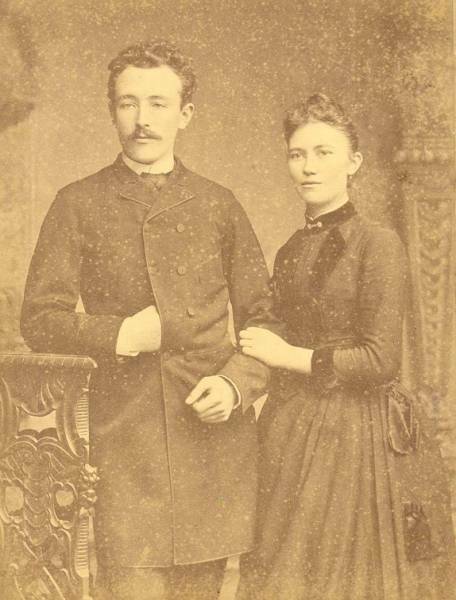 An older version of Cathrine and Hans Peter Mazanti, maybe at their silver wedding in 1887. 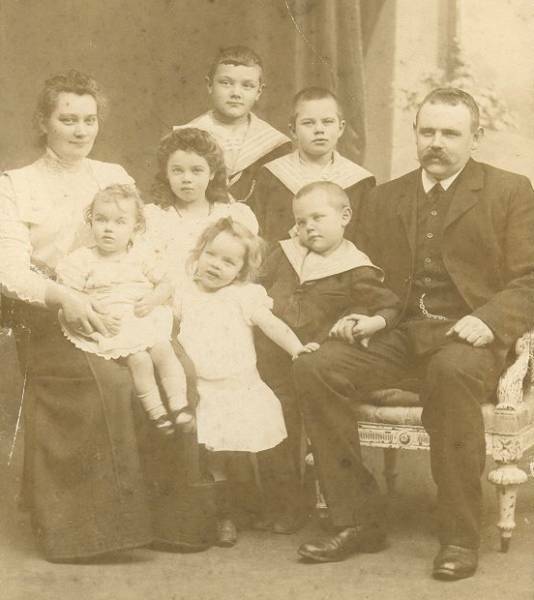 Hans Peter and Cathrine Mazanti and five of their children (1893). 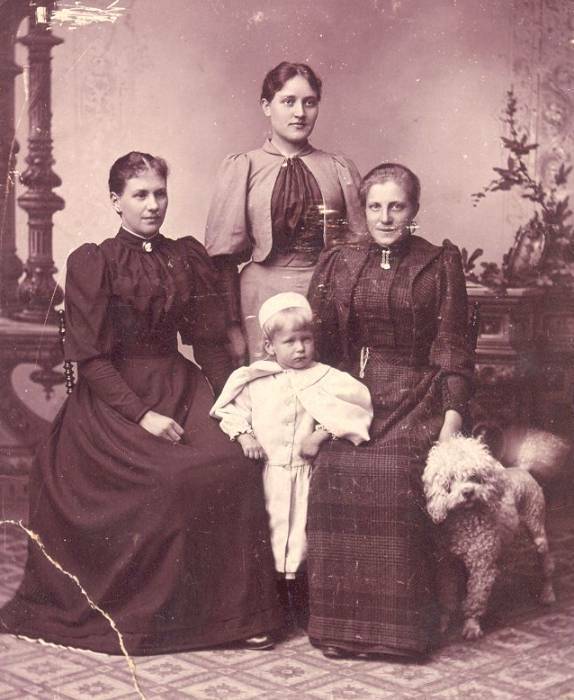 To the right: Johanne and Johannes, foremost Cathrine, Betty (with her baby Ellen, born Oct. 1892) and Carl. The photo was taken in the garden behind the home in Nørregade 50. 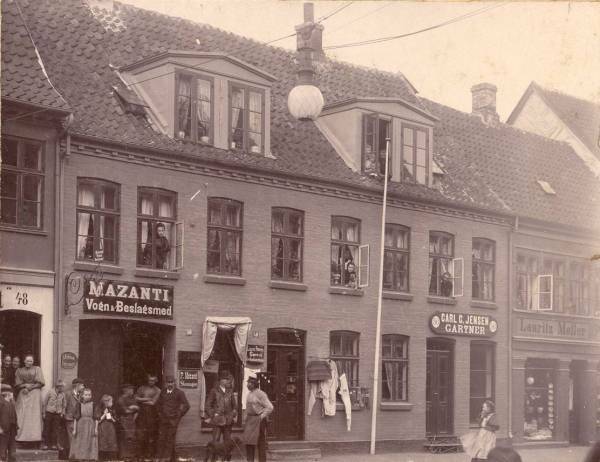 Nørregade 50, Odense (1896/97). 1880 Hans Peter Mazanti's father-in-law made over the house to him. 1896 the son Johannes started his farrier business at the adress - the sign above the gateway says "Mazanti - Farrier". On the ground floor: a hosier and a gardener. A section of the previous photo - the windows at the second floor to the right. Hans Peter Mazanti peeps out to the right, to the left the youngest daughter Cathrine (Nine) can be seen with a dog and behind her you can faintly see her sister Johanne who died in 1898. 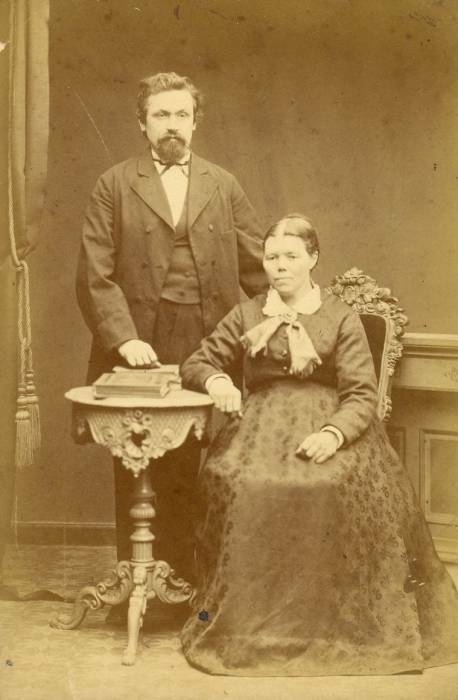 Martinus Mazanti, born 1844, Carl and Johanne Mazanti's youngest son, and his second wife Sophie. For many years the couple had got a tobacconist's at Nørregade 50. After this all the photos are depicting Hans Peter og Cathrine Mazanti's children, children-in-law and grandchildren. 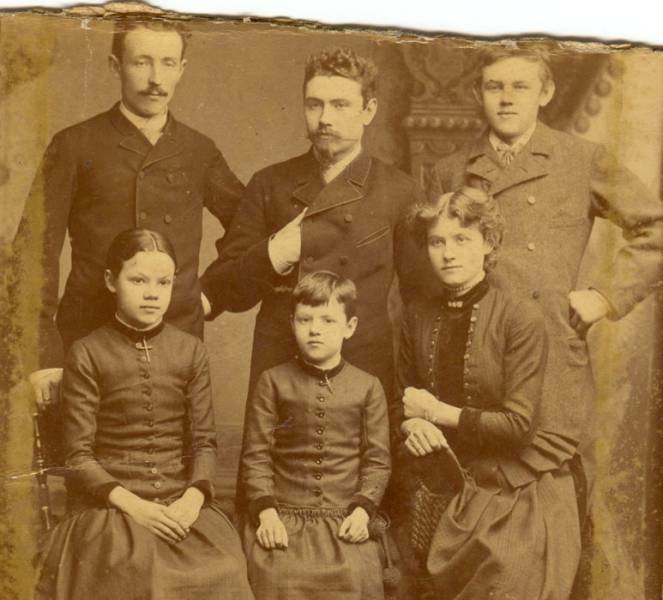 Hans Peter og Cathrine's surviving children (five died when small) at the oldest son Peter's wedding day, 28th March 1889. The boys: Peter, Carl and Johannes - the girls: Johanne, Cathrine and Betty. The bride and goom, Marie Christiansen and Peter Mazanti. Marie was waiting in Odense when her fiancée worked in Germany or Switzerland with his brother Carl. Carl wrote in a letter for his parents: "Not many men have got such a good little Marie which she is..."
Peter Mazanti in København some years before - probably before his departure southwards towards painter jobs. 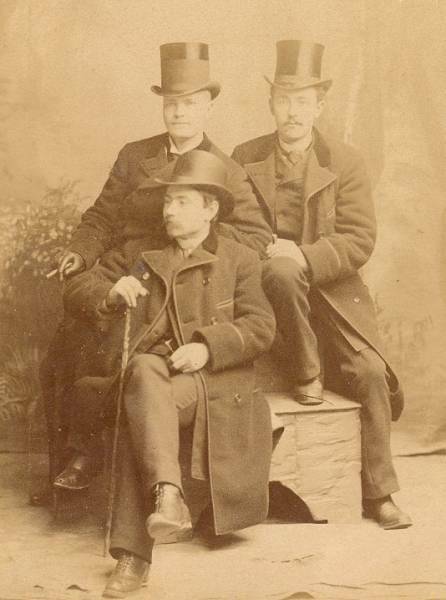 Three young tradesmen in Odense about 1888/89 - some self-assured guys! Peter Mazanti is sitting to the right, in front his brother Carl, the guy to the left is a friend. 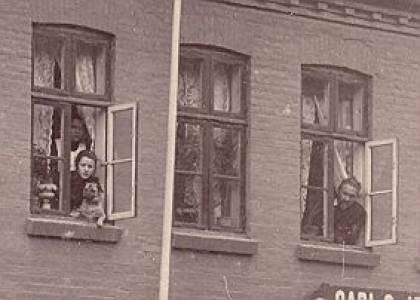 They had been working in Germany and Switzerland for some years and without doubt they had become men of the world, returning to good old Odense! 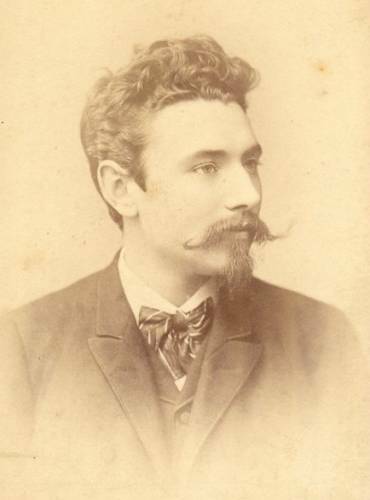 Master painter Peter Mazanti (about 1907). For years the relationship between him and the rest of the family was bad because of disagreement in money matters but they were reconciled. Marie Mazanti, Peters wife, two years before her death (1919). Both husband and wife passed away early - at 60 he died, she was 56 years old. 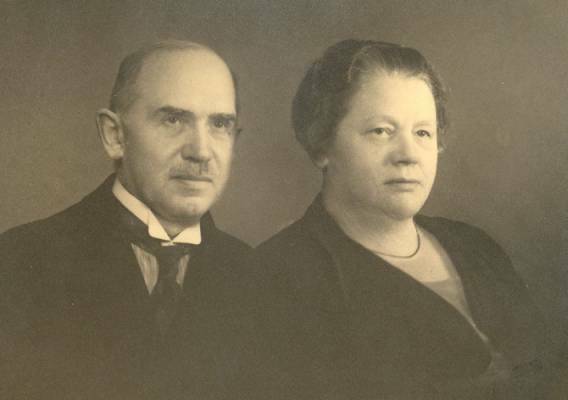 Marie and Peter Mazanti's sons, Christian Peder (born 1892) and Fritz (born 1893). Christian Peder went to California but died when young. Fritz became a dentist and was living in Switzerland for some time. 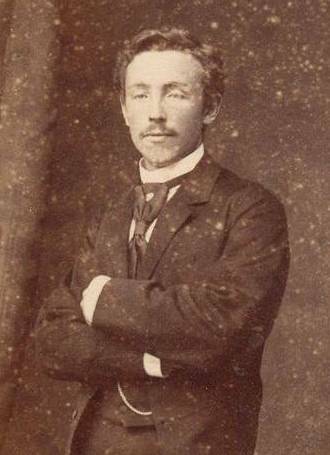 Carl Mazanti, Hans Peter Mazanti's son, in Copenhagen about 1883-85. March 1883 Carl had served his painter apprenticeship, afterwards he worked with master painters in Copenhagen until the summer of 1885. Subsequently he went to Leipzig, Germany. He worked in Germany and Switzerland for three years. In July 1898 Carl Mazanti, very much in love, gave his fiancée a photo: "I am sending my pretty? face to my beloved little Anna, indeed it is taken 4-5 years ago when I had a pointed beard but probably you'll recognize me..." I think this is the mentioned photo - Carl certainly has got a pointed beard here. The object of Carl's choice, the cook Anna Hansen (in the middle), in Copenhagen about 1895. 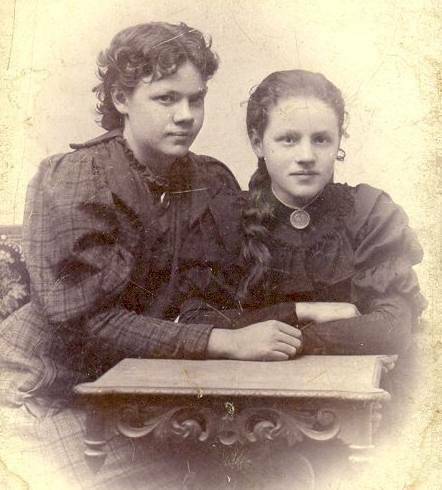 The girl to the right (probably) is Eline Henningsen, housemaid in the household in which Anna worked too. Eline introduced Anna to the Mazanti family. The girl to the left probably is the nanny. 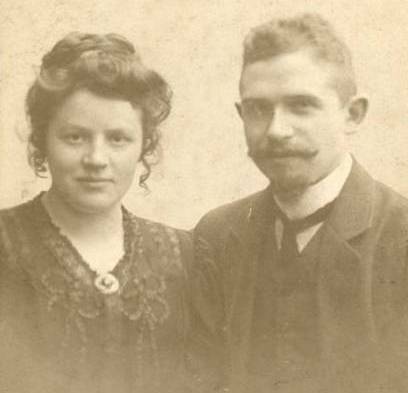 Carl and Anna got married in October 1898, following four months of engagement. 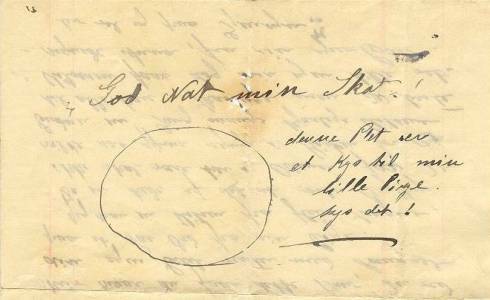 This is a section of a letter, written by Carl for Anna shortly before the wedding. It says: "Good Night my Darling! This spot is a kiss for my girl, kiss it!" 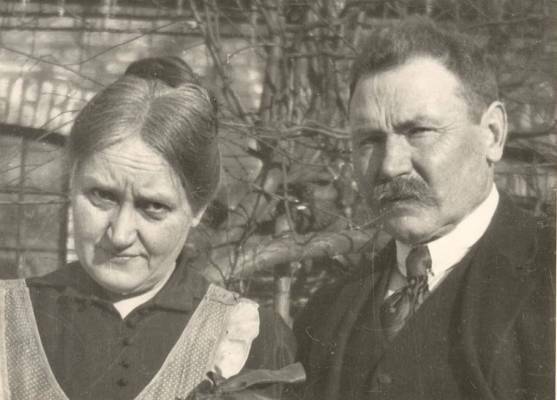 Apparently no wedding photo exists but this is Carl og Anna in August 1900, presenting their first child, Carl. 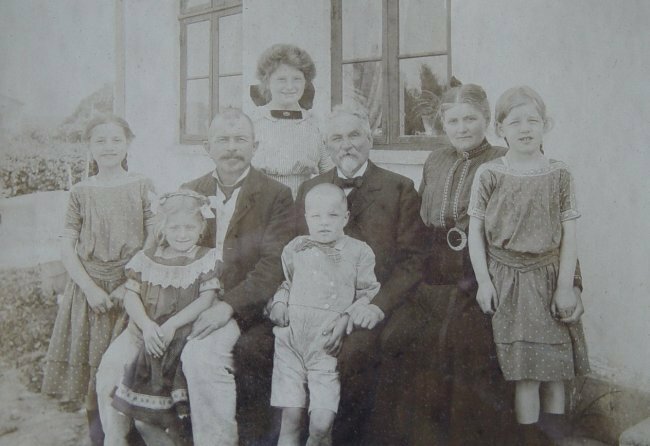 Soon the family grew, 1912 they had six children: in front Erik, Eigin and little Thorkild, behind them Grethe, Carl and Rigmor. 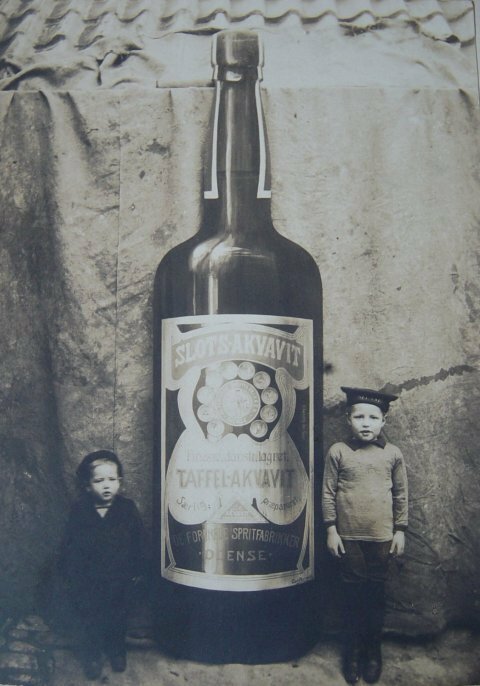 About 1913 Carl Mazanti painted a fancy poster for the United Distilleries, representing a blown-up bottle of akvavit. Proudly he sent for a photographer and had it immortalized with his youngest children, Thorkild and Erik. 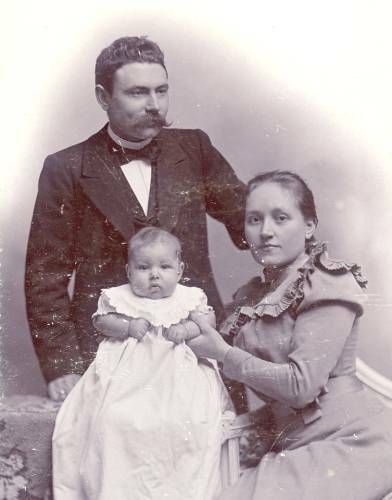 As the climax of Carl and Anna's familiy Ruth Mazanti was born. This is 2-year-old Ruth (1916). When Carl Mazanti was 51 years old his 25th anniversary as a master painter was celebrated. Probably this photo dates from that period. 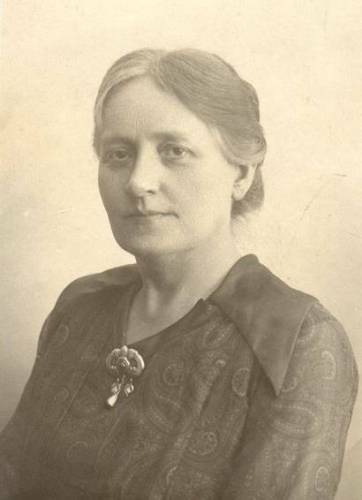 Anna Mazanti, née Hansen (about 1915). Anna and Carl Mazanti in their garden at Nørrebro 37 in Odense, winter 1921-22. At that time they had got seven children at the ages 7-22. Soon Anna became a widow - in May 1922 Carl died from a thrombosis. The rest of the family has joined. Between Anna og Carl: the oldest son, Carl, and his fiancée Ellen Lumholdt. To the right the son Erik, to the left the daughter Grethe and her fiancée, Thorvald Rasmussen. 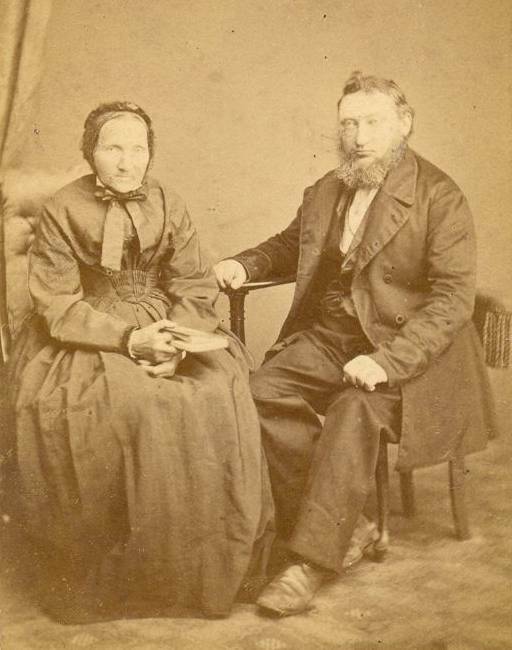 The youngest children: Thorkild and Ruth. Rigmor and Eigin are missing. Ruth Mazanti (wearing girl scout's uniform), the youngest child, a sweet and lively girl - but 1929 she died when she was only 14. She died from injuries following a pointless accident. Because of a driver's incautiousness a car hit the poor girl, standing on the pavement and looking on a shopwindow. Betty Mazanti, born 1867, Hans Peter Mazanti's oldest daughter. Maybe at her confirmation? 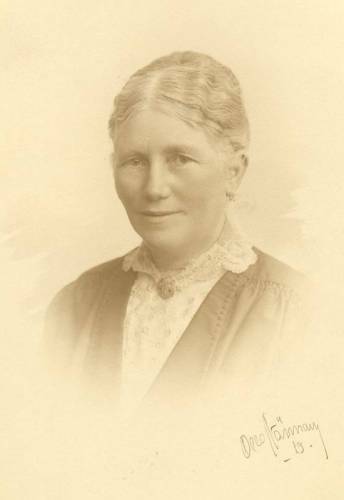 Betty married Carl Andersen who became a gasworks manager at the small port Fakse Ladeplads at Eastern Zealand. 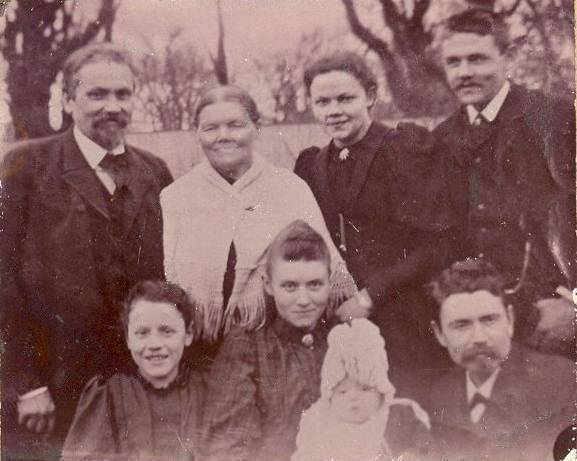 Here the family are sitting by their house, accompanied by guests from Odense (about 1910). From the left Rigmor Mazanti, Carl with the daughter Lilly, Hans Peter Mazanti with Eigin Mazanti, Betty with Grethe Mazanti. Kathrine, daughter of the house, is standing in the background. 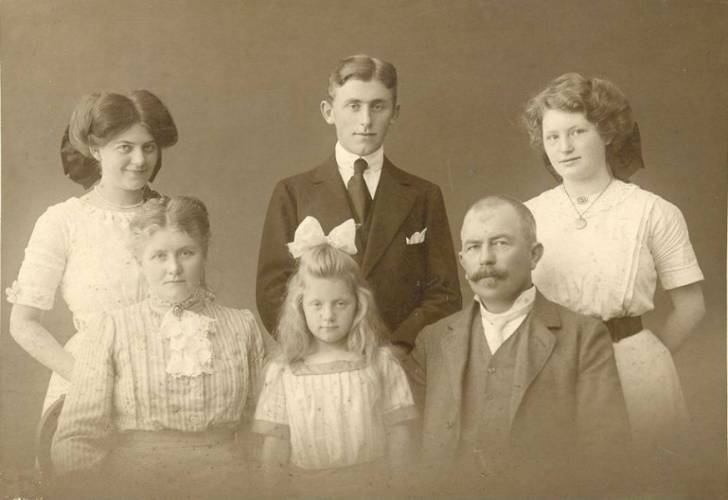 The Andersen family about 1915. 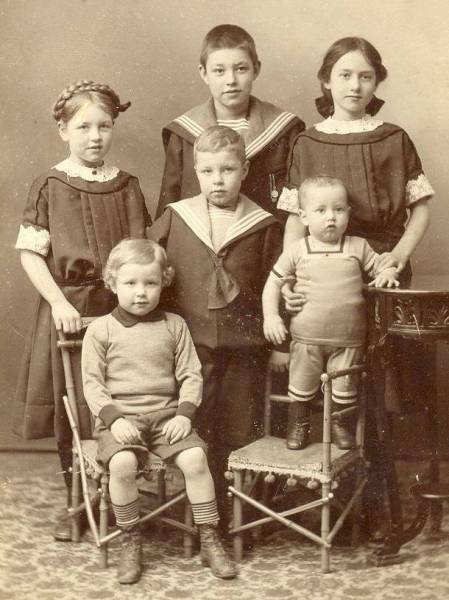 Betty and Carl are sitting on each side of the afterthought Lilly; behind them the older children, Kathrine, Carl and Ellen are standing. 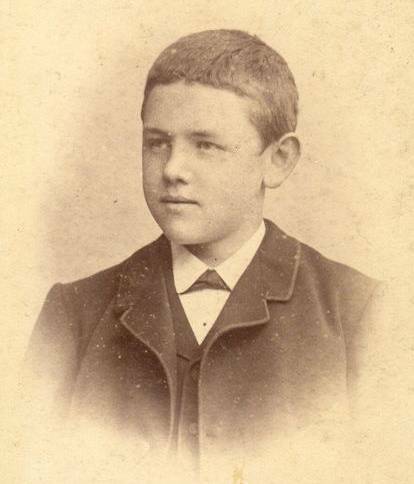 Youngest surviving son among Hans Peter Mazanti's children, Johannes, born 1872. His second name was Krogh and that's what his siblings called him. When he was a boy he wanted to become a painter like his older brothers but later on he changed his mind and became a blacksmith. 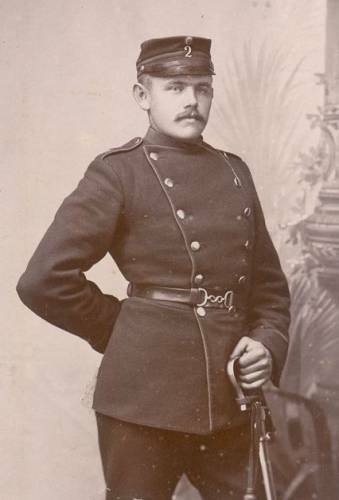 Johannes Mazanti when he was a soldier. 1890 he got his journeyman's certificate and this photo was probably taken in one of the following years. 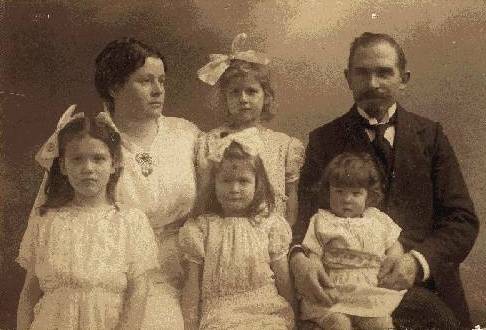 Johannes Mazanti and his wife Laura in 1909, accompanied by six of their seven children. Behind: the sons Johannes og Emil, in front of them Johanne og William and foremost the little ones, Laura og Gudrun (Gudde). 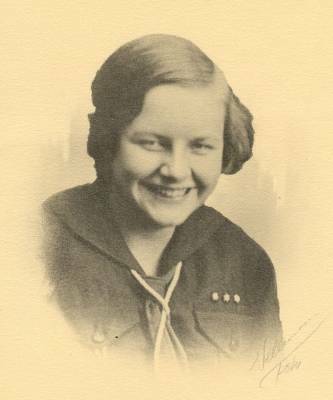 Gerda was born in 1910. 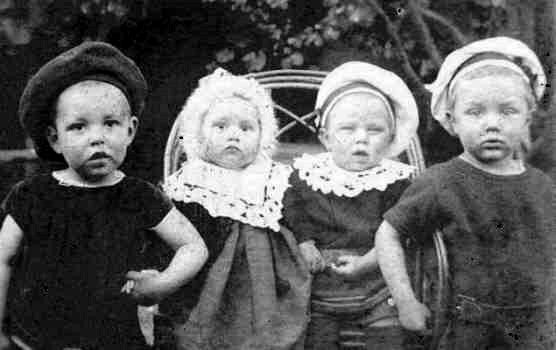 Four little Mazantis, 1901. 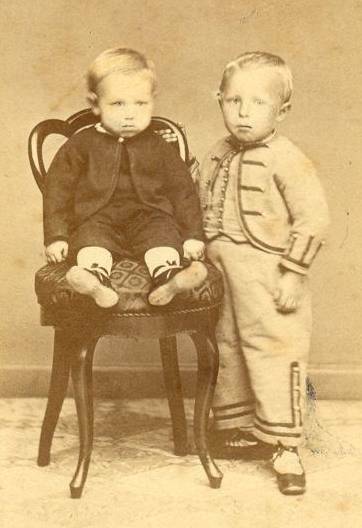 Left: Carl Mazanti's children, Carl and Rigmor, right: their 1st cousins Emil and Johannes, Johannes Mazanti's sons. 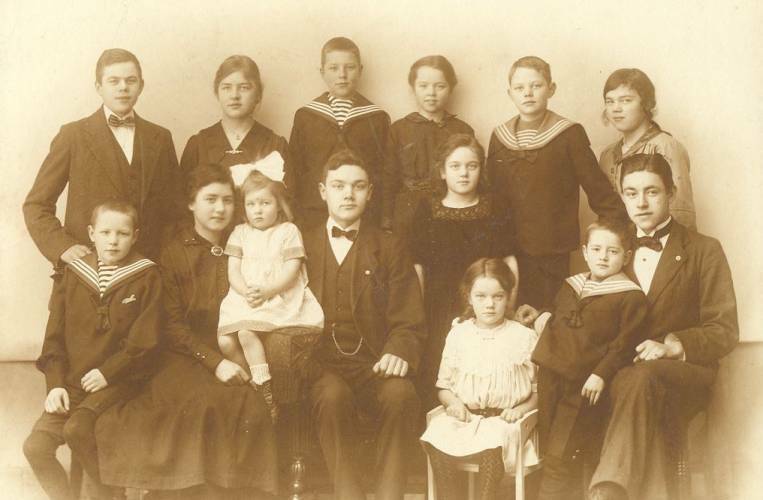 14 1st cousins about 1917: Carl Mazanti's 7 children (A) and Johannes Mazanti's 7 children (B). In front: Erik (A), Rigmor (A), Ruth (A), Johannes (B), Laura (B), Gerda (B), Thorkild (A) and Carl (A). Behind: Emil (B), Grethe (A), Eigin (A), Gudrun (B), William (B) and Johanne Margrethe (B). 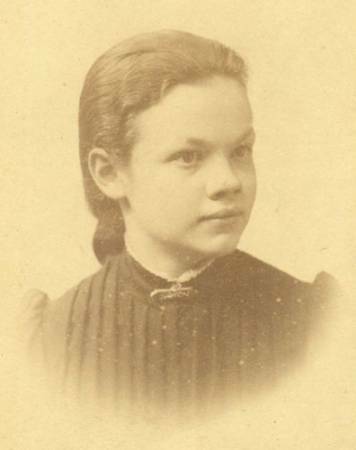 Johanne Mazanti, born 1876, Hans Peter Mazanti's daughter. Her death at the age of 22 was very tragical. She caught thyphoid fever and was hospitalized - but a high temperature made her insane and she threw herself out of a window. 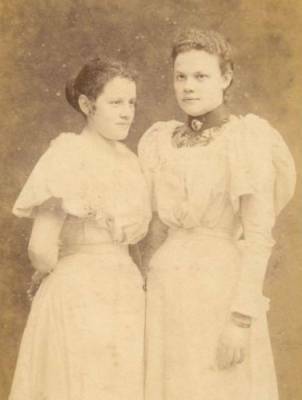 Hans Peter Mazanti's youngest daughters, Cathrine, born 1879 (called Nine) and Johanne (pet name Grethe). 1895 the girls lost their mother and after that they were responsible for the housekeeping. Johanne and Nine Mazanti. Losing her beloved sister was a terrible loss for Nine. But it was a comfort when her brother Carl soon after married their friend Anna Hansen. Anna was like an older sister to her. In a letter she told Anna that poor Johanne's greatest wish had now become true, "she always wanted you to be together." Cathrine (Nine) Mazanti and engineer William Norden. They had this photograph taken in Copenhagen where they settled down after the wedding in September 1906. The photo was probably taken shortly afterwards. 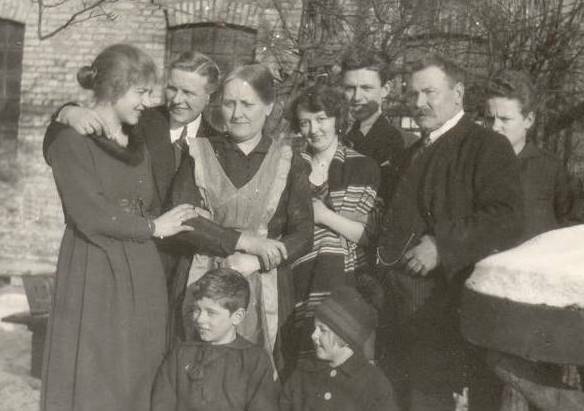 Cathrine and William Norden about 1917, with the four daughters, Karen, Bodil, Else and Grete. William and Cathrine Norden. For many years they lived in the port Frederikshavn in Northern Jutland, William procuring sailors for the ships. 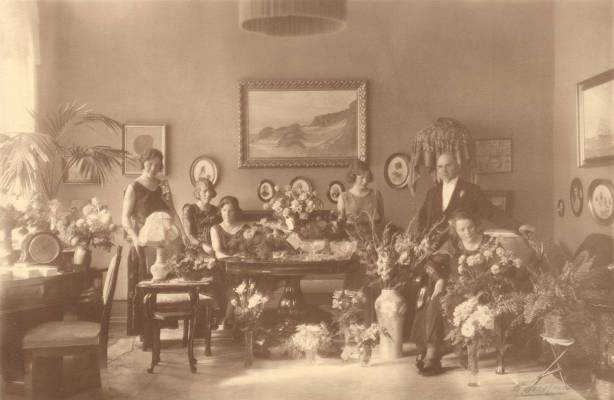 The Norden couple and the four daughters in the family's living room at a festive occation, probably the silver wedding in 1931.